Rare are those recipes when an unexpected combination turns out surprising well. This dark rosy kisses is an outcome after spending hours in flea market and organic shop looting alluring brown tableware and some organic rose buds. After a series of imagination all I dreamt was the combination of brown and pink. Cherry on top was when my colleague gave me organic honey, creative instincts worked magic thus these dark rosy kisses were created. 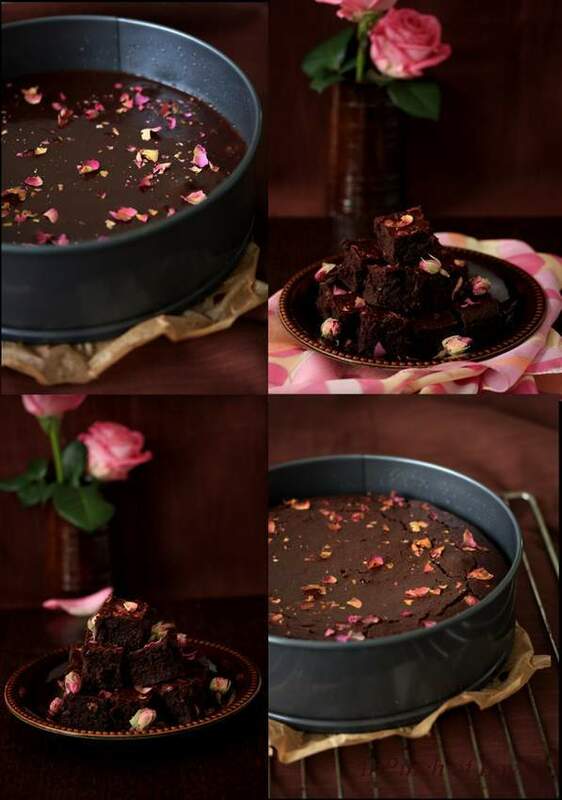 The recipe is the combination of dark chocolate, honey, rosewater and dry rose buds. Honey gives these kisses a dense and moist feel. Rosewater in the desserts and sweets are more of an acquired taste for those tasting it for the first time; let me warn you since you might feel them like a scented dessert! Give it an elegant touch by serving the individual pieces on rose petals with a little ribbon tied, an eye appealing treat! Ok! Now this post is my first guest post for Sohini's blog Cassia Bark, dancing feet. I have known Sohini from our initial days of blogging; her sweet and encouraging comments drove me to her blog where I felt warmth through her words. Very soon we befriended each other through facebook and now no looking back. I’m a great admirer of her sugar art for cakes and cupcakes, different versions of beautiful princess cake and her eastern food makes me drool. Not forgetting to mention the pictures of her little adorable edible princess, which wants me to her a big bite, but I go aww! So people do hop over to Cassia Bark for interesting recipe and for the recipe of dark rosy kisses! !